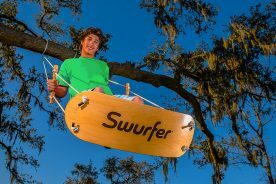 Swing-N-Slide playsets have been putting kids first since 1985. 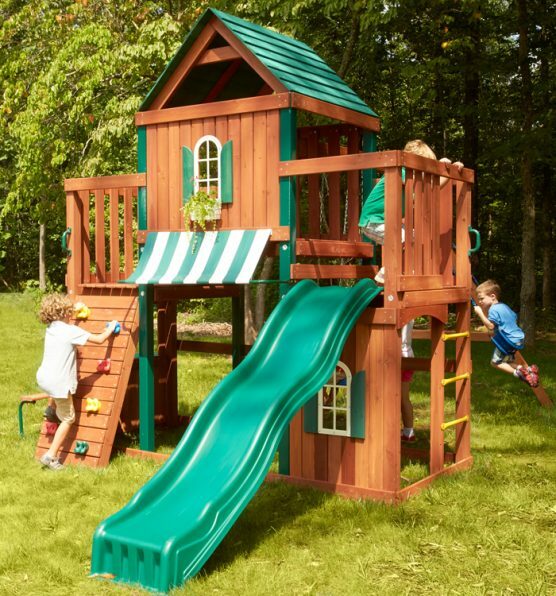 This long-standing company has been leading the way in backyard playset innovations and continues to offer a wide selection of quality products that exceed safety guidelines. Swing-N-Slide, established in 1985, was the first manufacturer of do-it-yourself wooden playgrounds. It continues to be a leading playground equipment company providing fun, safe, and valued playsets for residential and commercial use. As well as providing directly to the consumer they also distribute to hardware store, home centers, and playset retailers. The company’s commitment to quality and safety have been a focus since the very beginning with the goal of providing kids and their families the safest and most reliable playsets available. The unique, do-it-yourself playsets allow families to tailor their playset to fit their budget and needs. The Swing-N-Slide company makes a serious commitment to safety as all of their products meet or exceed all United States safety guidelines and is a leader is safety standards. They are a member of the American Society for Testing Materials (ASTM) and serve on the committee designed to develop standards for playground safety. There are also a member of the International Playground Equipment Manufacturers Association (IPEMA), a trade group committed to safety in the industry. Most Swing-N-Slide playsets can be assembled by two people in one day regardless of how handy you are. Every playset or accessory comes with a complete set of illustrated plans. All plans have been tested for accuracy and easy-to-follow instructions. Manuals or plans are also available online in the case of lost or misplaced plans. 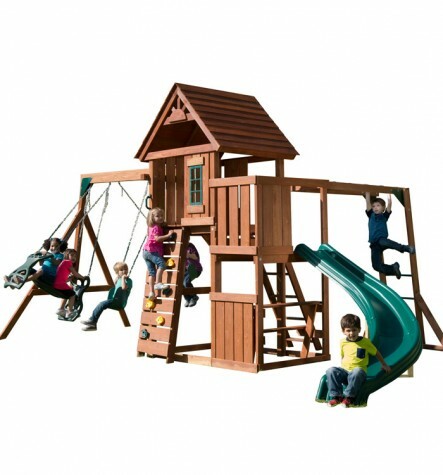 Playsets are designed for easy assembly, however, customer service is there if you need help. 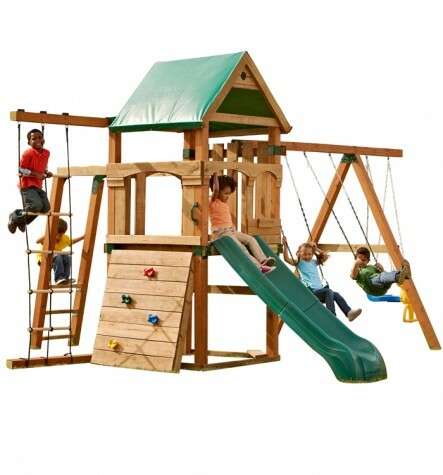 Playset specialists are available by phone, email, and even live chat. All have had hands-on experience building the actual products which is a level of customer service that is unexpected. In addition they have access to the playset plans, engineered drawings, and even products, as well as the manuals all to help you when you are in need. They also offer a list of local swing set installers to help if you are unable to spend the time on installation or need help. In addition to the amazing customer support as well as comprehensive plans the Rapid-Loc Bracket System cuts assembly time in half. This patented system is designed to simplify building and decrease the time. The brackets are engineered to fit inside each other and lock together with shared fasteners making an immovable junctions once the wood is in place. The Swing-N-Slide company is always improving itself and innovating new products. 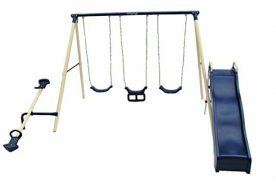 They introduced EZ Frame Brackets as an alternative to metal swing sets in 1988. 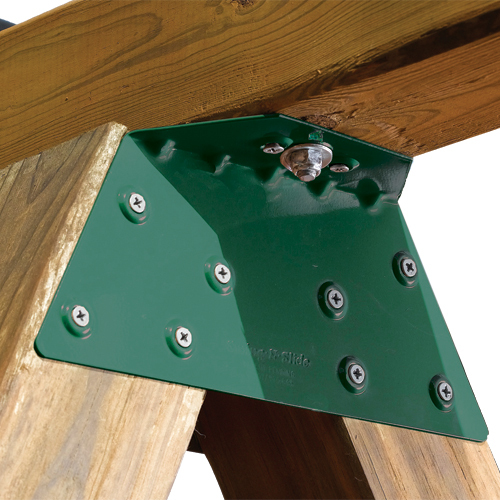 EZ Frame Brackets provide extra stability to your swing set and help make construction easy. They are made of powder-coated, rust-resistant steel that holds up to the elements for years to come. As an alternative to metal slides, the company designed the first plastic slide in 1990. The biggest benefits of plastic is they are cooler and lighter in weight. They are also easier to install. In addition they introduced the first tube slide to residential customers in 1992. Now the thrill of the twisty tube could be enjoyed in the backyard. The first rock climbing wall was created for residential use in 1999. It was designed with a realistic color and texture to increase its appeal. They even improve on their innovations as they did in 2001 when they designed the first SpeedWave slide with a modern scoop design. 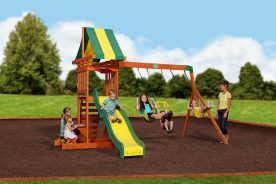 The Swing-N-Slide company offers a large selection of playsets that are easy to assemble and priced to fit any budget. There are three different categories for playsets. 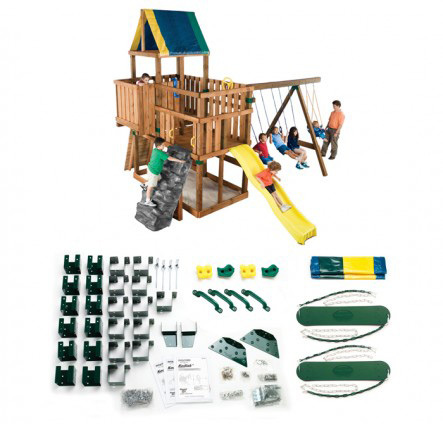 These kits have everything you need to build an amazing playset including pre-cut wood, accessories, slides, and hardware. The wood is not pre-drilled, however. The manual and plans are included as well as available online if you misplace yours. These playsets are mostly available at online retailers. Orders are shipped directly to your home. The no-cut kits include everything except the 4”x4” lumber beams, these would be for the swing beam and support beams. All other precut lumber is included as well as the Rapid-Loc bracket system. 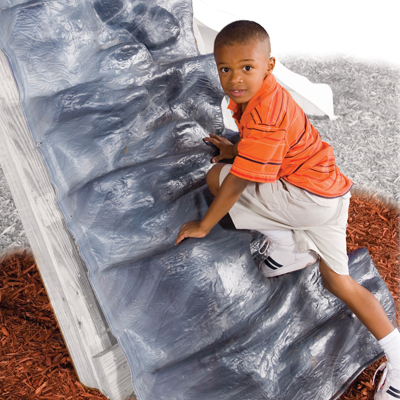 Accessories and hardware such as swings, slide, monkey bars, rock wall, or glider are also included. These kits are mostly available at brick-and-mortar retailers. The custom kits are designed for DIY families are include a lot of flexibility in the assembly and design. 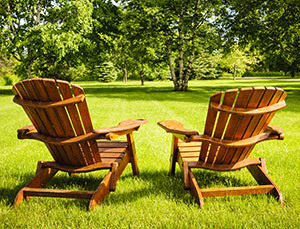 Each kit includes 3 to 4 design projects to allow you to create the swing set to fit your needs and desires. The kits include brackets, some accessories, and some hardware, such as brackets. Additional accessories, such as slides, can be purchased separately. Lumber and fasteners are purchased separately. For each project design the lumber requirements and specifications, as well as needed hardware are detailed in the included plans.